This is how it goes in 2010 at the ballot box: old orders are upended, political lions become roadkill, chosen successors get left behind and the outsider, riding a wave of discontent, becomes the new front runner. In quick succession on Tuesday night, the jittery inhabitants of Washington's marble halls found three more reasons to worry about their staying power. Pennsylvania Senator Arlen Specter, the Senate's patron saint of resilience, was turned out in a Democratic primary in favor of an unwanted rival, Representative Joe Sestak, who had neither major union support nor White House support. In Arkansas, Senator Blanche Lincoln, a model of Southern Democratic moderation, was forced into a primary runoff by a self-styled outsider, Bill Halter, challenging from her left. And in Kentucky, the Washington establishment's chosen Republican Senate candidate, Trey Grayson, fell to the son of a libertarian outlier who carried the flag of another party. "I have a message, a message from the Tea Party, a message that is loud and clear and does not mince words: We've come to take our government back," declared Rand Paul, son of Representative and former presidential candidate Ron Paul, upon winning by a double-digit margin. In all three races, voters rejected the instructions of their party's leadership, as they have repeatedly this year in states as varied as Utah and Florida. Indeed, even before the polls closed, that leadership had mostly gone into hiding. President Obama traveled on Tuesday to Youngstown, Ohio, just miles from the Pennsylvania border, where his chosen candidate, Specter, was struggling to get voters to the polls in the rain. But Obama, who once promised his "full support" of Specter, made no mention of the primary, choosing instead to tour an 85-ton electric arc furnace. "It's just nice to get out of Washington," Obama said. Vice President Joe Biden, a decades-long colleague of Specter who had also promised "full support" and rarely misses an opportunity to stump in his native Pennsylvania, spent his day in Iowa. On Capitol Hill, Republican leaders also hid from the elephant in the room. Senate Republican leader Mitch McConnell, who had handpicked Grayson for his home state, made no mention of the election when he met with reporters in the Capitol. "Obviously, the biggest item around the Hill this week is the oil spill in Louisiana," McConnell said instead. With less than six months to go before the midterm elections on Nov. 2, all signs are pointing to a tidal wave. Electoral railbirds, steeped in historical stats, point to the many bad signs for Democrats. In polls, Republicans and conservatives demonstrate much more enthusiasm than Democrats and liberals. The President's approval rating is below 50%, and more registered voters say they expect to vote for Republicans than Democrats for Congress. "This is as favorable an election for Republicans, as hostile for Democrats, as any in recent memory," says Mark Blumenthal, editor of Pollster.com. But Republicans have their own worries. In addition to anemic fundraising, the Grand Old Party faces a simmering insurrection in its ranks. Apart from the defeat in Kentucky, Utah Senator Bob Bennett, a moderate fixture of the Washington establishment since 1992, lost his bid for re-election two weeks ago, after his state party's convention delegates revolted over his vote to bail out banks and work with Democrats on health care reform. In Florida, the once popular Republican governor, Charlie Christ, recently abandoned his party to launch an independent bid after a more conservative challenger threatened to deny him a shot for the state's open Senate seat. This anti-incumbent mood pervades both parties, leaving open the possibility that the same wave that brought Obama into office in 2008 will undo his governing majorities in 2010. The one bright spot for Obama was a special election on Tuesday night in Pennsylvania's 12th district, where Democrats held on to a seat in a conservative district previously held by John Murtha, the big-spending defense appropriator who died earlier this year. The seat was won by Mark Critz, a pro-life, pro-gun former Murtha staffer who opposes health care reform and overcame significant Republican spending. The victory demonstrated that Democrats still have hope for making congressional races local, not national, affairs in the fall. But this is scant consolation for those incumbents who have become less and less comfortable with each turn at the ballot boxes this year. On Tuesday afternoon, Specter, whose career has survived two bouts with cancer and two party switches, seemed his old fighting self. In an interview on MSNBC, the host suggested that his opponent, Sestak, was more vigorous. "You must be smoking Dutch cleanser," Specter responded, in typical cantankerous fashion. Just a few hours later, at a downcast concession speech in Philadelphia, Specter did not have much fire left to show. "It's been a great privilege to be in the United States Senate," he said of his 30-year career. "Thank you all." And with that, he quickly left the stage. Read "Primary Voters Put Washington on Notice." See the world's most influential people in the 2010 TIME 100. 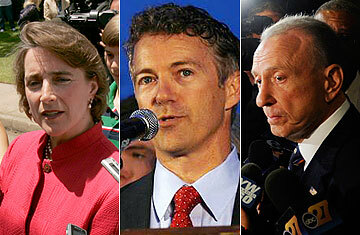 See the top 10 political defections.